In 1610, a man was walking home along a lonely road in the Pangasinan region when he happened to hear a lady’s mysterious voice. Turning around, he was greatly surprised to see a radiant lady holding a small child on one arm while a rosary was suspended from her right hand. The vision appeared to be standing on a bright cloud over a small bush. Saying nothing, the Virgin looked sweetly at the man – who was now on his knees in profound reverence. The Blessed Virgin seems to have protected this region ever since then from numerous threats. There was a time in which mountain tribes were accustomed to burning Christian villages. One day, when Manaoag was destined to be torched, flaming arrows were shot into the little church. Not a single flame set it on fire. On an even greater scale, during World War II, four bombs were dropped. Three landed on the patio and only damaged the facade of the church. One bomb crashed through the roof of the church, but it failed to explode inside. The church was miraculously saved. In 1698, huge swarms of locusts began to ravage the rice fields. They came in swarms so vast that the sky was darkened. An image of the Blessed Virgin (that had been brought to the Philippines by Padre Juan de San Jacinto of Spain in the early 17th century) was taken out to the fields. Desperate for help, they placed the small image on the ground and then watched in amazement as the locusts began to destroy each other in a totally unexpected manner that had never been witnessed before. The carnage continued until not a single locust could be found alive. Another miracle took place during the drought of 1706. The fields had been scorched by the drought, and the seedlings were shriveled from the heat. As days passed with more sun, heat, and no rainclouds, the people began praying to Our Lady for help and took her image once more out to the fields. During the first day of a novena, and after a procession with the miraculous statue, Our Lady showed her compassion again for this region by gathering rain clouds as soon as her image was returned to the church. The sky dimmed and a downpour of much-needed rain soon fell. This rainfall continued for many days until the ground was refreshed and the crops were saved. After he pleaded with Our Lady of Manaoag, the flames immediately died down and were extinguished. Once again , the church was miraculously saved. Many pilgrims visit the shrine of Our Lady of Manaoag every year – but, especially during the months of April and May when annual, worldwide pilgrimages occur. Many other miracles attributed to Our Lady are depicted in giant wall paintings in the church. The crowds were huge on April 21, 1926, when the Papal Nuncio canonically crowned the image of Our Lady of Manaoag. 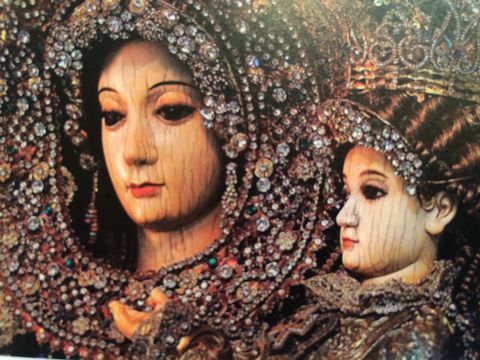 Allegedly, Our Lady visits all the barrios of Manaoag and all the towns in the district of Pangasinan every twenty-five years.